INCREASE FLEXIBILITY IN YOUR CALVES, HAMSTRINGS, & FEET OR YOUR MONEY BACK! Are your tight calves preventing you from living life on your terms? Is your plantar fasciitis rehab taking too long? Now you don't have to go to the physical therapy clinic every time you want the stretch you need. Save precious time and money and use our stretching board whenever you want from the comfort of your home! NOW YOU CAN OWN WHAT THE PROFESSIONALS USE! Handcrafted from premium, durable plywood with a birch wood veneer, our incline board arrives fully assembled and ready to use for a lifetime of relief! Features 4 (10, 20, 30, 40 degree) angles, and a stress-tested, safe and simple locking system so you can accurately measure your performance results and recovery progress. If you don't think our exercise slant board is as good as the one at your gym, then we'll refund your money! Pretty cool, huh? IMPROVE BALANCE, MUSCLE MOBILITY & RESPONSIVENESS FOR OPTIMAL PERFORMANCE! Experience relief from plantar fasciitis, Achilles tendonitis, patellar tendonitis, shin splints, calf strains, ankle sprains, and even hip pain so you can enjoy the freedom of a pain-free life! We are convinced you will think our wood multi slant board is the perfect stretch machine for calves, hamstrings, hips, feet, and ankles. And, with our INCLUDED EXERCISE GUIDE what more could you ask for? SIMPLIFY TRANSPORT & STORAGE WITH OUR PREMIUM OXFORD CLOTH TRAVEL BAG! Take your recovery and workout anywhere. 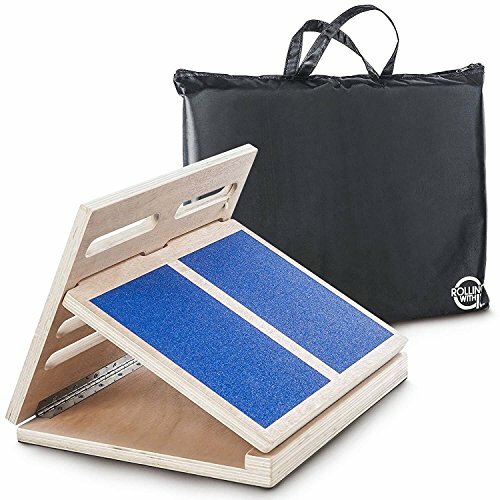 Our foot and ankle slantboard measures 17.5 inches long by 13.25 inches wide by 2.5 inches thick when folded flat and has been tested to support weights up to 300 lbs. It's lightweight, durable and easily foldable so you can get your stretch on in your home, office, clinic, or hotel room! How cool is that? WORRY-FREE PURCHASE GUARANTEE: Why would you trust a product that only has a 30-day warranty when you can get one for life? At Rolling With It, we are so confident you will be blown away by your results and the professional quality of our slant board that we will refund your money if you aren't 100% Satisfied! Add to your cart now while supplies last so you can enjoy the benefits of better mobility and flexibility, improved balance, and faster recovery! If you have any questions about this product by Rolling With It, contact us by completing and submitting the form below. If you are looking for a specif part number, please include it with your message.